The sight of carved pumpkins tucked into the corners of porches brings to mind memories of childhood Octobers, of biting cold nights hurrying about the neighborhood with a bucket of candy collected from obliging doorsteps, of lighting tea lights to place inside hollowed out jack-o-lanterns and festive costuming assisted by maternal imaginations. In the fall, the seasonality of produce shows colors of orange and yellow and deep green in the flesh of pumpkin, of butternut and acorn and delicata squash. We scoop and discard the sticky, slimy mess of seeds tangled with pulp but if there’s a bit of time to clean and roast them, those seeds make for a salty, crunchy snack. There are countless combinations of spices and flavors you can toss with pumpkin seeds, ranging from cheesy to sweet to plain salt and pepper, and this recipe is but one delicious variation. 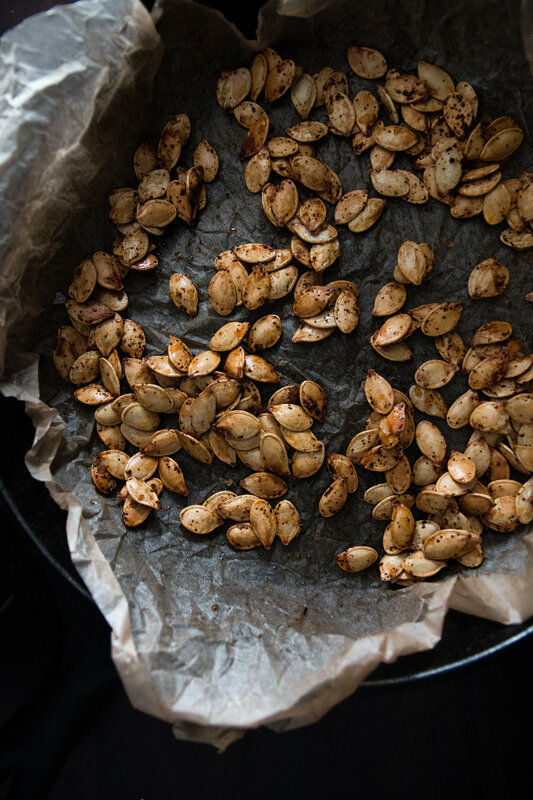 The amounts are per cup of pumpkin seeds, so adjust them to account for how many seeds you’re roasting. I like to use parchment paper to keep the honey from plastering them to the pan. While you can use regular paprika if that’s what’s in your spice cabinet, smoked paprika adds a layer of smokey flavor that contrasts well with the sweet honey and spicy chili. Recipe amounts per cup of pumpkin seeds; adjust the measurements to the amount of seeds your pumpkin yields. Preheat the oven to 350 degrees. Clean the pumpkin seeds by rinsing with water in a colander and patting them as dry as possible with a kitchen towel. In a mixing bowl, toss the seeds with the olive oil, honey, chili powder, and smoked paprika. Spoon the seasoned seeds onto a baking sheet or cast iron skillet, making an even layer of seeds, and sprinkle a good pinch of salt or two over them. When the oven is heated, place inside and toast for 30 to 40 minutes, or until the seeds are dried and crunchy. This time can vary depending on how moist your seeds are, so give them a taste at the 30 minute mark and see if they need to be crisped further.